When I was in Cambodia a few years ago, I was happy to discover that chess was very popular there. Everywhere in the streets of Phnom Penh, on the sidewalks in front of barbershops, at rickshaw waiting stations, at flee markets, there were groups of excited men standing around two players slamming pieces into the board. Everybody kibitzed, nobody minded, touch was not move - everybody was touching the pieces, and sometimes a kibitzer simply took over a game begun by somebody else. It was not the international chess they played but Makruk, the Thai variant, which however is close enough for a western chessplayer to learn it quickly. I'll explain the rules below. When I thought I knew them, and saw a game going on outside a barbershop, I gestured to some bystanders that I would like to play too. The game was immediately stopped, no matter how I protested that I would be glad to watch until it was my turn. And when I sat down and put my little stained and torn rucksack on the dusty sidewalk, somebody got a piece of cardboard, and put it underneath. In one game, I was certain I was going to beat quite a strong guy (the other guys around our board made it clear he was their champion), because the difficult pieces had been exchanged, and we were down to two Rooks and Knight for me versus one of each for him. Then he sacrificed his Knight for no reason that I could see. I thought it might be some funny, perhaps typically Cambodian way to resign, but with his next move, he also gave away his remaining Rook, triumphantly declaring the game was now a draw. A happy laughter broke out, and everybody agreed I'd been had. I did not doubt their honesty (we only started to play for money after that - yes, maybe he wanted to hustle me, but then he'd have let me win) so I guessed I was the victim of some rule I didn't know, and the language barrier didn't help. Later I found out my opponent had made use of the Makruk equivalent of the fifty-move rule - see below. It was strange and touching to see that in those streets where chess was played so passionately, on the one hand no one had heard of Kasparov or the Sicilian, while on the other hand their chess-machismo was exactly that of the analysis rooms and chess cafes here. That leaning back in triumph, with a spread-out hand: 'See, patzer? '; that lifting of a rook about to be speared into its decisive square, that joyful malice with which a forbidding bottlecap was shoved precisely to the middle of a square and then screwed into it. How good these players were at their own game is hard to say, but sometimes just the western pieces remained, and I did see a street champion mishandle K+R vs. K. After the first day, I occasionally beat some local patzers, but against the real players I had no chance. The barbers and rickshaw riders were reputed to be especially good players, but I heard about a player in Phnom Penh who, I was told in awe, boasted that whoever beat him, had the right to kill him. The people I stayed with tried to arrange a meeting or even a game with this living legend of Cambodian Makruk, and it is a pity it didn't happen, because it would have been interesting to know if his boast worked the other way, too. The reason I'm reliving my chess days in Phnom Penh is that recently, I found a freeware Makruk-playing program on the Internet. You can download it here. It's 347 kB, runs in DOS, and needs Expanded Memory. The rules are, as said, close to those of International Chess. The board, except for its non-checkered appearance, is the same. If I remember well, you keep one colour throughout a series of games, White and Black beginning alternately. (Against the program, you always have White. It asks you whether you want the first move or not). King, Rook and Knight are placed and move as in International Chess, but the white King starts on d1 and there is no castling. Pawns behave like our pawns, but they start on the third rank, have no double move, and they promote (to Queen only) on the sixth rank. The Queen, the weakest piece, is the medieval queen or firzan: a one-square bishop. The Bishop moves like this queen, but it can also go one square straight forward, making it a rather strong piece, probably not much weaker than the knight. The program seems to treat them as equal. In Phnom Penh I was taught that for its first move, the King can make a Knight's leap (e.g. Kd1-b2) and the Queen can start with a double move (Qe1-e3 or Qe1-c3) but these seem to be old-fashioned rules, and the program doesn't allow them. The game can only be won by mate, and stalemate is a draw. The only really complicated rule is this equivalent of the fifty move rule. 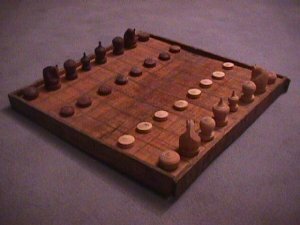 When a player does not have any of the major pieces left (Rook, Knight and Bishop), his opponent must mate him within a specified number of moves according to the material he has left. This can range from 8 to 83 moves and if he fails, the game is a draw. In different sources, I have found different numbers for the different remaining configurations. Maybe what happened to me in that street game was that I was swindled by something like a stalemating combination, my opponent sacrificing his remaining men to reach a position where I could not mate him in the prescribed number of moves. 1.Reg1 A queen's sacrifice. 1...Rxe5 (why not Nxe5?) and now the solution is given as 2.Bg7+ Kh7 3.Bxg8+ Kh8 4.Bh7+ Kxh7 5.Rg7+ Kh8 6.Rg8+ Kh7 7.R1g7 mate. I don't want to pose as a Makruk expert, but can't this be speeded up two moves by 2.Bh7+ Kxh7 3.Rg7+ Kh8 4.Rxg8+ Kh7 5.R1g7 mate ? 1.Nd4! A nice magnet combination. Bxd4 is impossible on account of 2.Rxe6, so: 1...Kxd4 2.Rc7 Be4 3.Bc3 mate. Hans Bodlaenders pages The Website for chess variants. University of Tuebingen Makruk and other freeware strategy games for downloading. Sriwittayapaknam School A Thai chess club.